"The Minā’ī ceramic is defined as a polychrome under glazed decorated ceramic. It is called “Hefet Rank” in Persian which means the spectrum of colors. 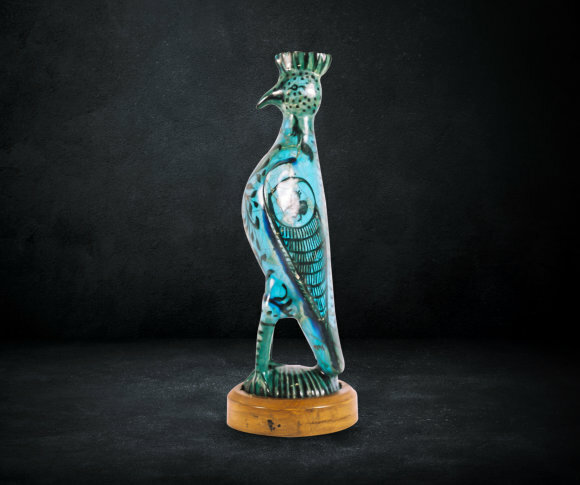 It is one of the famous types of Persian ceramics produced in numerous Iranian cities. It is characterized by its variety of decorative subjects inspired by the literary Iranian stories, and the Seljuk school of miniatures which often adopted the idea of gilding. The story of the seven princesses, the story of Bahram Gur and Azdah, in addition to numerous miniatures of princes and princesses of the royal court, scenes of hunting, fighting and singing are just some examples. The Turkish influence on Minaʾī ceramics is clear the chubby Turkish faces with fair skin, flowing hair and long whiskers. This style was also characterized by the depiction of animals such as camels, fish and the like, in addition to mythical creatures and humanoids with a human face on a lion’s body. The rims of the dishes were embellished by an epigraphic frieze describing the main subject displayed on the artifact. The artisan didn’t ignore the adornment of these dishes with various vegetal designs that reached a very high standard of precision and perfection. 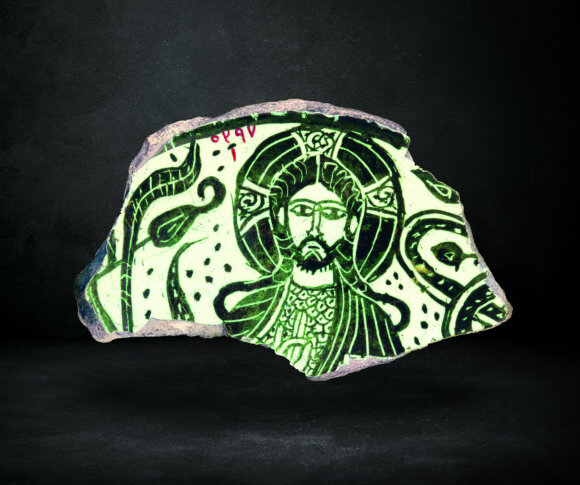 "This fragment depicts what is believed by some to be the portrait of Jesus Christ, with a beard and long hair, carrying a book ,thought to be the Bible, bestowing his blessings with his right hand. His two fingers symbolize the dual nature of Jesus, and some researchers believe that his other three fingers symbolize the two letters Alpha and Omega, as mentioned in the Apocalypse of St.John. 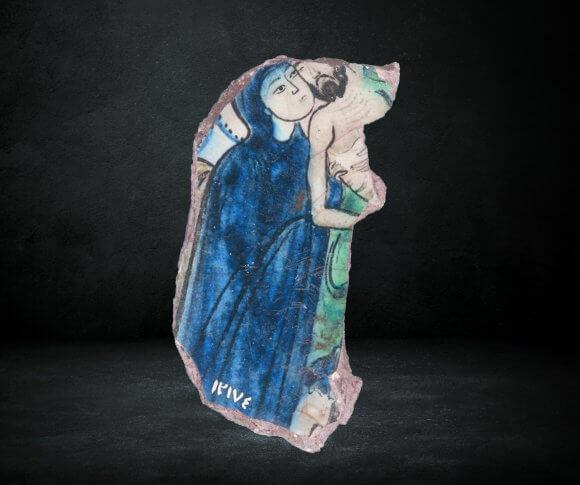 This scene is repeated in Coptic Art in the wall paintings of the monastery of Bawīt, in Upper Egypt, 5th century AD, which reflects the religious tolerance towards non Moslems in the Fatimid period. 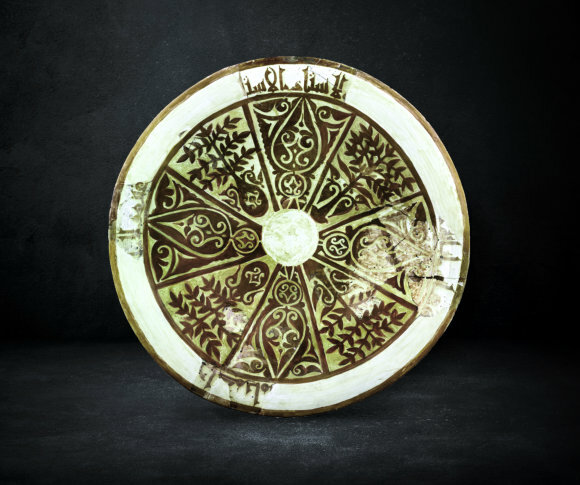 "This dish is considered the biggest of all ceramic plates in Islamic Art, decorated with stylized vegetal motifs and Kufic writing on the inner rim which says: “ The master Ghabn..Lord , Ḥakim bi’ Amr …on his fathers” . This refers to one of the army commanders in the reign of al-Ḥākim bi’ Amr Allah. 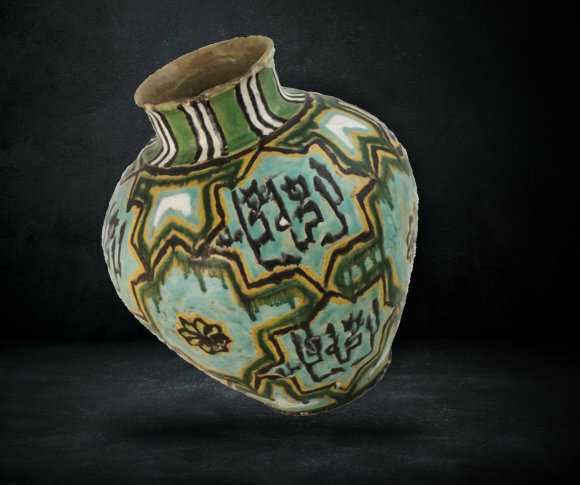 "ceramic jar, so - Called Fayoum ceramic decorated with floral, geometric and epigraphic motifs of various colors. 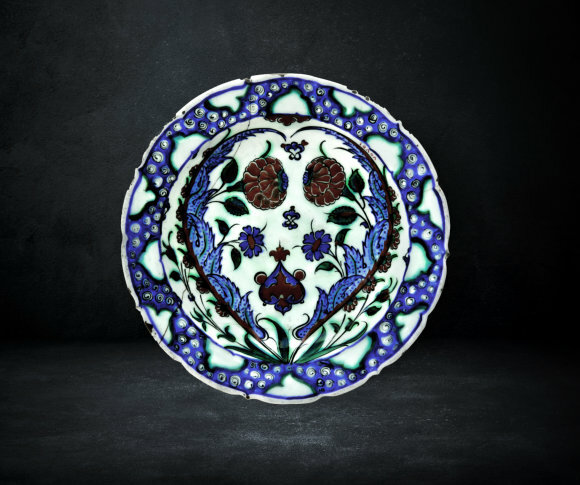 "This piece is considered the most important masterpiece of Ayyubid ceramics in the world. It is decorated with a Coptic scene depicting Jesus Christ(pbuh) and the Virgin Mary. Its complementary part is preserved in the Benaki Museum in Athens and depicts the apostles of Jesus Christ(pbuh). Its unique historical value stems from the fact that it is an undeniable physical evidence of Moslem tolerance to other faiths, at a time when the Crusading armies were attacking the Islamic World. 8th A.H /14th A.D century. "The term “rank” (blazon or coat of arms) is derived from a persian word which means a sign, or color. 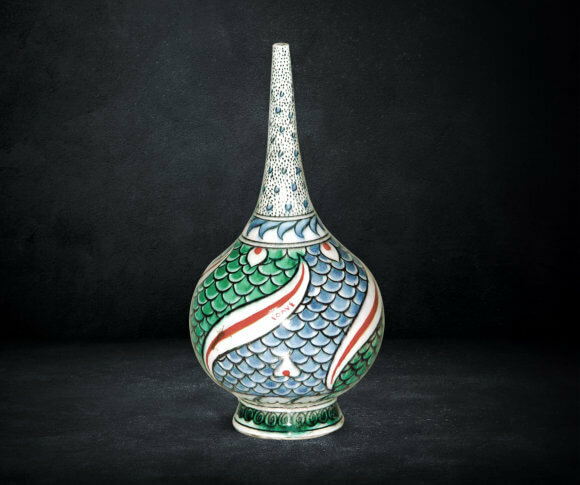 It is among the pivotal decorative elements distinguishing the mamluk art and architecture. 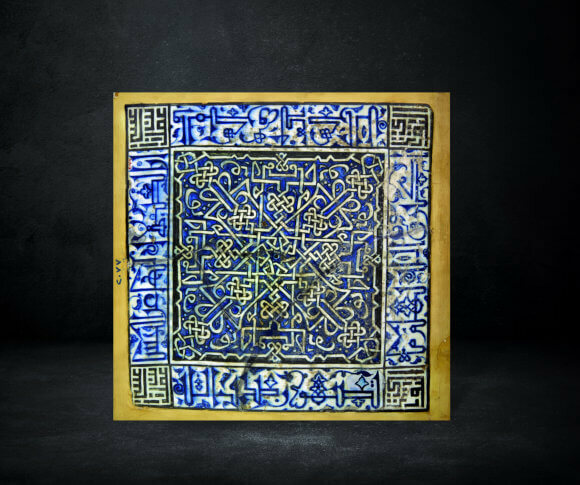 "This tile is one of the most famous of all mamluk tiles as it bears the name of the ceramicist Ghayby al-Tawrīzī who has his name written in quadrangular Kufic script on the four corners of the tile. These inscriptions reflect the mastery of the Moslem artisan in including the written script as a central element in decoration. It also reflects his talent in rendering the script one of the principal characteristic aspects of Islamic Art. An inscription band lies in the center of the piece and reads: “trust the most helpful”, repeated eight times. The outer rim is decorated with a verse from the Quran which reads:”Indeed, prayer prohibits immorality and wrongdoing, and the remembrance of Allah is greater, and Allah knows that which you do” (Sῡrat al-‘Ankabῡt, verse No.45), and ends with the phrase “Allah has spoken the truth”.